Indonesia will postpone until 2020 trade rules requiring exporters of coal and crude palm oil to use only Indonesian-flagged vessels, Industry Minister Airlangga Hartarto said, among efforts to increase foreign exchange reserves. 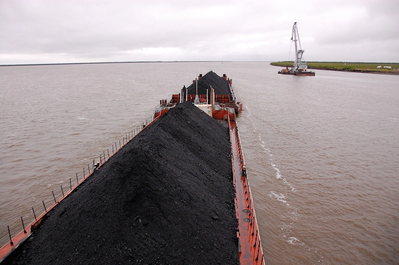 The rules, due to take effect this month and intended to boost the archipelago's shipping industry, were initially postponed in February after raising concerns in coal and palm oil industries over the availability of local vessels. "The timing will be adjusted, and a special two-year period will be given for shipping (industries)," Airlangga told reporters, referring to a planned revision of the trade ministry rules. A trade ministry official in charge of mineral exports did not respond to Reuters questions on the matter. Airlangga said the government would push for so-called cost, insurance and freight (CIF) shipping contracts, allowing exporters to choose transportation, whereas most shipments are currently made on a free-on-board (FOB) basis. "We can save foreign currency and at the same time develop our national shipping industry." Rules mandating the insurance of shipments by Indonesian insurers would still be imposed with an additional grace period of three months from the date the trade rules were initially due to come into effect in May. "This is a matter of readiness. As long as national shipping companies are ready, we'll support this," said Hendra Sinadia, executive director of the Indonesian Coal Mining Association. "As long as there's clarity going forward and this doesn't burden exporters in principal, it's no problem."